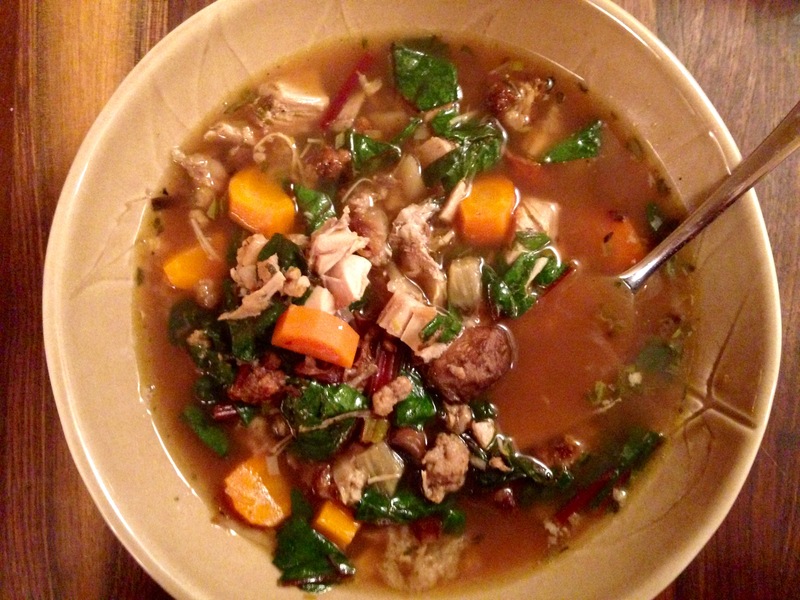 I made gumbo for the third time on Friday and was pleased to see that, once you have the basic concepts down, there are an endless number of ways to riff on this tasty one-pot dish. 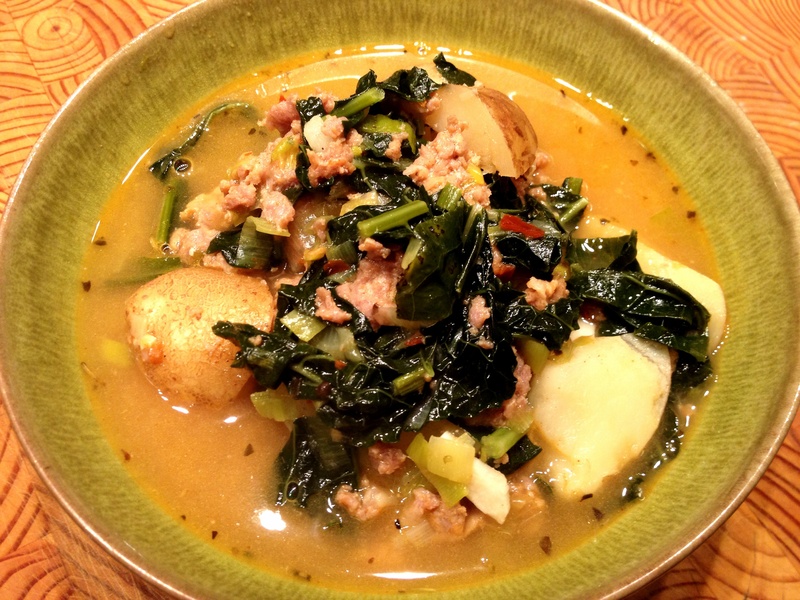 Pictured here is Friday’s creation, which featured bacon, smoked Louisiana sausage, Maine shrimp tails, okra and mustard greens (these first three ingredients being just a sampling of the proteins lurking in my cramped freezer). Some might consider the mustard greens to be heresy, but I thought that they made for some nice flavor and texture contrast. 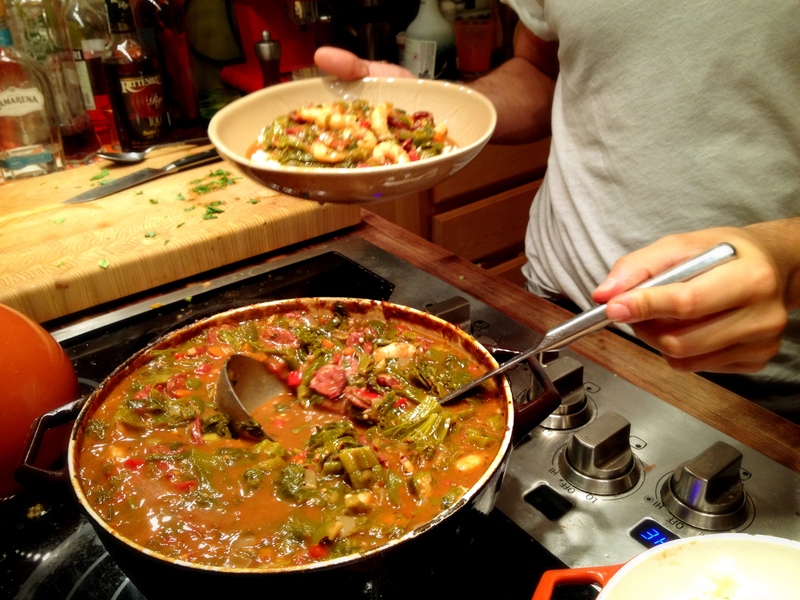 What follows is a step-by-step documentation of my very first gumbo. By following these steps, you can make a delicious gumbo using whatever meats, seafood, stock and produce you have on hand. It’s a great way to clean out the freezer. 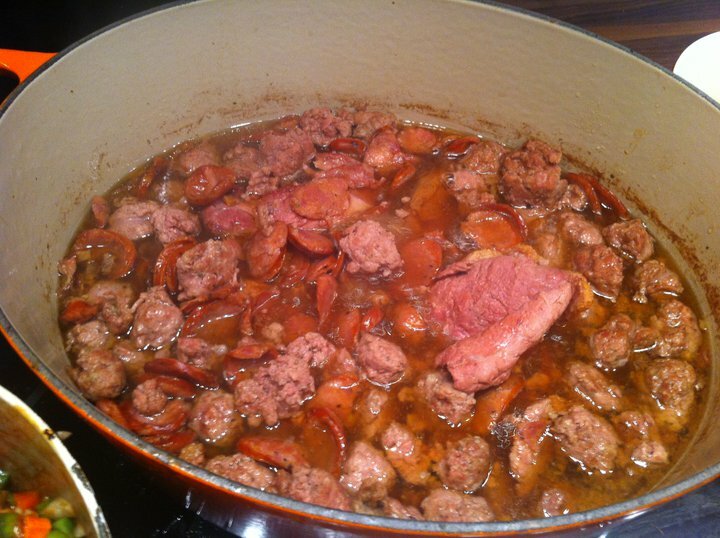 STEP 1 – Gather a bunch of meat and brown it in batches in a nice big heavy-bottomed pot. 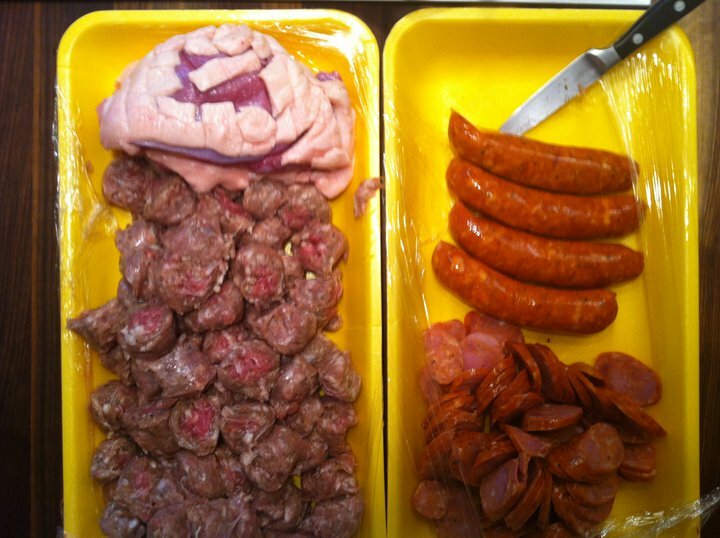 In this case, we have duck breast, andouille sausage, kielbasa and smoked hog jowl. STEP 2 – While you’re browning the meat, dice your veggies. 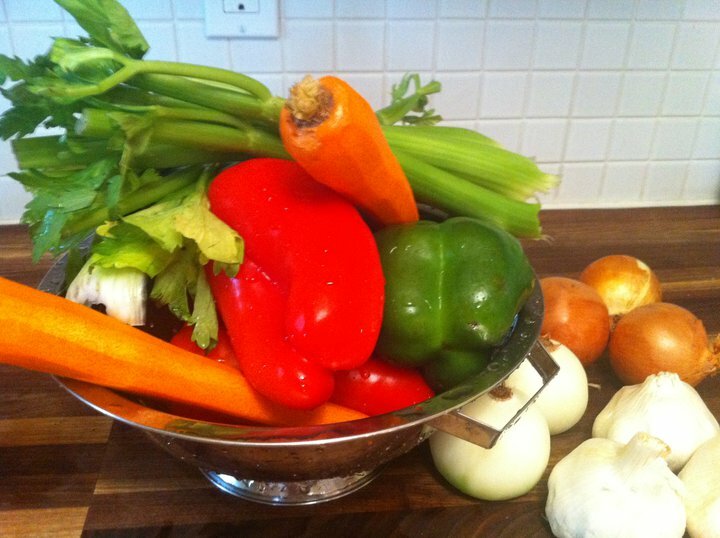 Celery, onion and green pepper (“the holy trinity” of Cajun cooking) are traditional. Carrot, red bell pepper and garlic are nice additions. 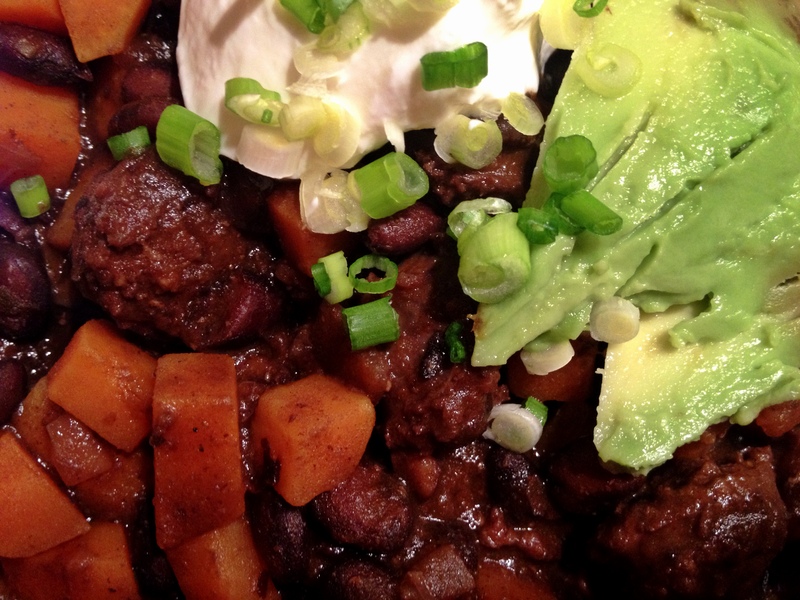 You can also add jalapenos or other hot chile peppers, if you’re into that kind of thing. 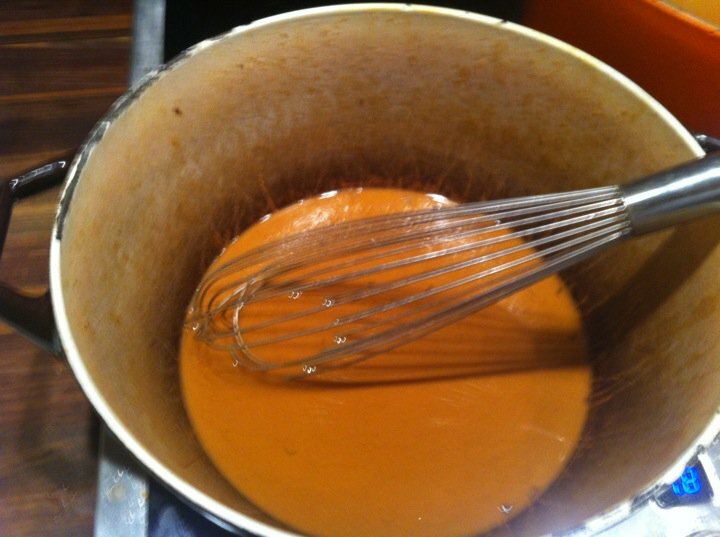 STEP 4 – Now it’s time to make the roux. Add approximately as much flour as you have rendered fat from browning all of that meat and start whisking. 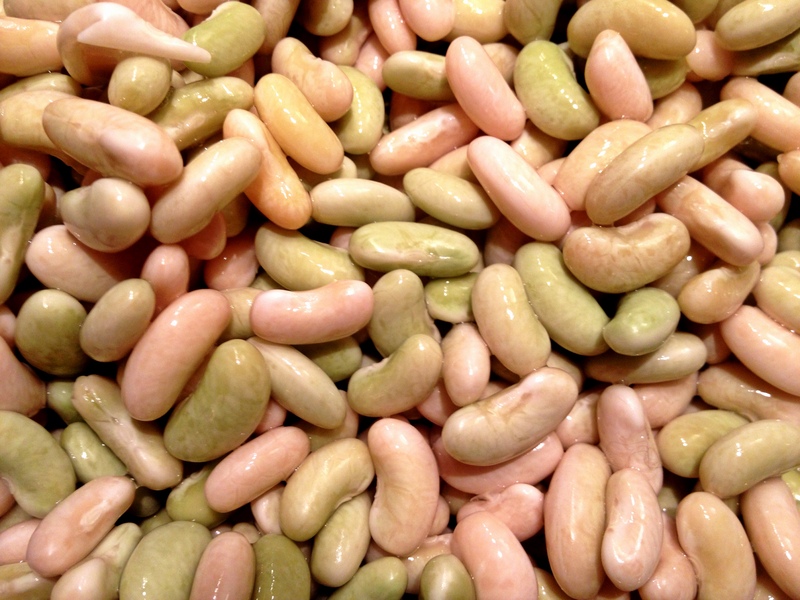 If you’re low on fat, you can supplement with whatever hard fat you have on hand – butter, schmaltz, lard, vegetable shortening, etc. 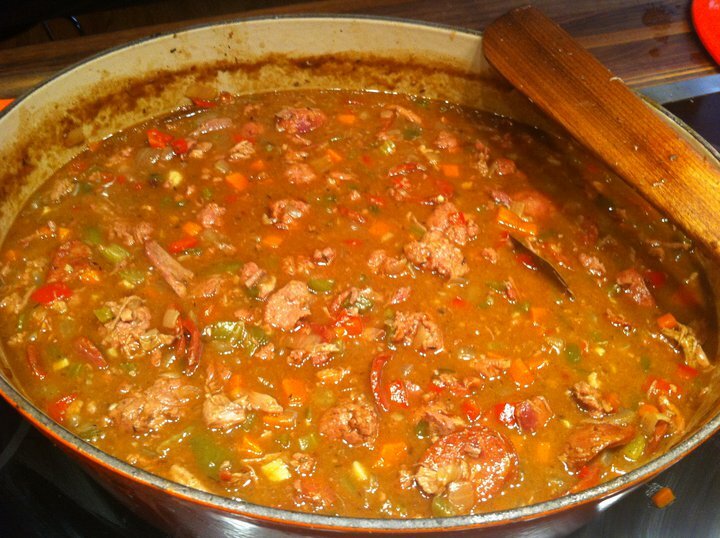 A cup of fat and a cup of flour will do you right for one large pot of gumbo. 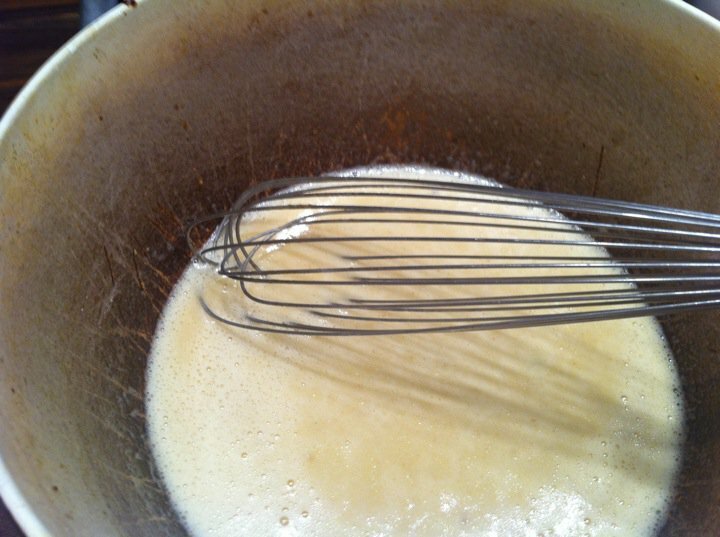 STEP 5 – Keep whisking. I recommend NPR podcasts to keep you company. STEP 6 – Now would be a good time to crack open a beer. But don’t stop whisking. The key is not to let it burn. 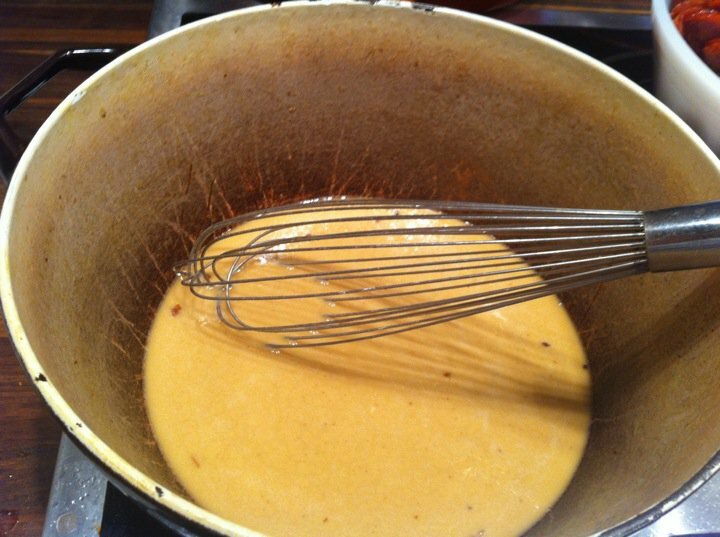 STEP 7 – When you can’t stand to whisk any more, you’ve got your roux. If you taste it, it will not be yummy. Do not be scared. 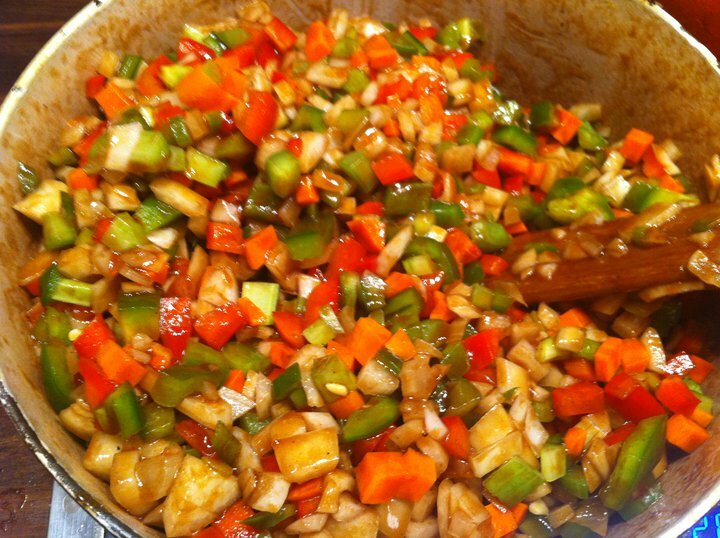 STEP 8 – Add your chopped vegetables into the roux and stir frequently until they start to soften. Toss in some herbs. Fresh or dried thyme, oregano and basil are all welcome. Cayenne, paprika and other dried chiles can also be added. Then dump it all, plus some bay leaves into the really big pot with the simmering meat. 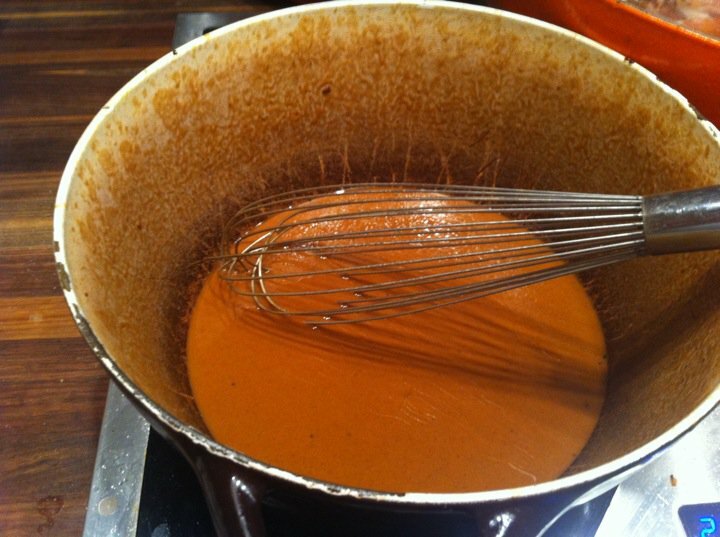 STEP 9 – Let is simmer and simmer and simmer. At some point, you’ll want to pull any large hunks of meat out and shred them. Maybe turn the burner off, lid the pot and take a nice bike ride. While you’re out, pick up some really cheap french bread to serve with the finished product. It’s traditional. 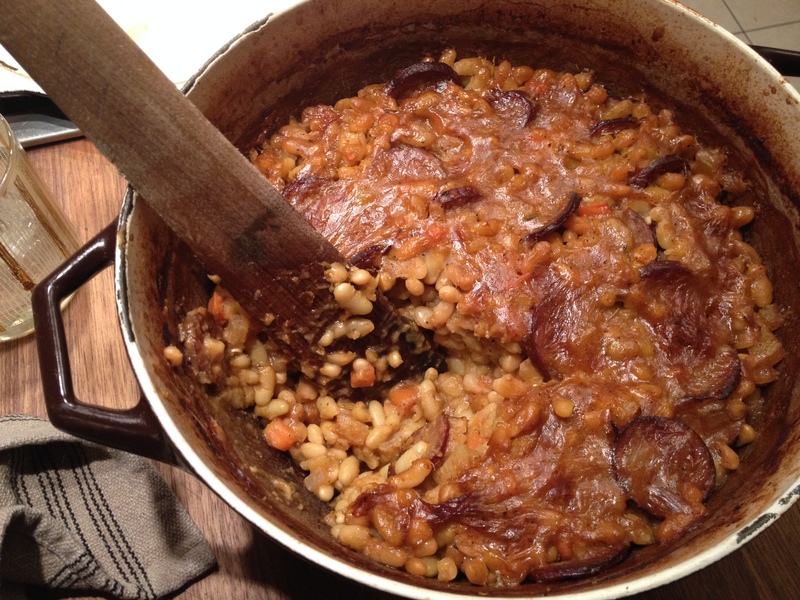 STEP 10 – Fire the burner back up and keep simmering. Taste and adjust seasoning with salt, pepper, whatever hot sauces you have in the fridge, maybe a little more wine, some vinegar, etc. Make a batch of Sazeracs. Make another batch. Make some long-grain white rice. Add some okra, some chopped up oysters, some parsley and anything else your heart desires. Have some more Sazeracs. Just don’t get so drunk that you forget to take a picture of the finished product. Oops.